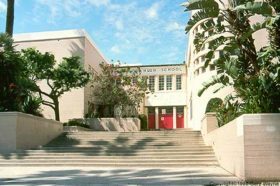 Hollywood High is populated with many personality types: performers, dancers, nerds, rockers, guitarists, models and ﬁlmmakers. The community around Hollywood High encourages students to dream big and has a little bit of everything. Students are able to walk across the Walk of Fame every single day. People around the globe wish to be there and see the famous landmarks, the Walk of Fame, the Chinese Theater, the Pantages Theater, and for students it is just around the corner. The “nerds” have a library right across the street from them, book stores, and all types of tutoring programs around them. The musicians have the Guitar Center, Amoeba Records, and the LA Recording studio at their ﬁngertips. They are able to walk right up and explore all types of music and see that artistic view differently.Fashionistas have the mall right across the street where they can explore the different brands. Filmmakers have the LA Film school where they are able to see their dream everyday as they walk by the Nokia Theater hoping that one day they will be sitting their as their ﬁlm is being nominated for an Oscar. Hikers are able to walk up and see the sign for themselves, not to mention the Griffith Park Observatory that draws tourists from all over the world. Hollywood gives so many opportunities other schools do not have. The neighborhood is ﬁlled with all types of food to please every different taste. The diversity around Hollywood High is often taken for granted, when it should be appreciated.